Lake Victoria, Africa's largest lake is one of the African Great Lakes, it has a shoreline of 4,828 km. Three countries share the lake: Kenya, Uganda and Tanzania. 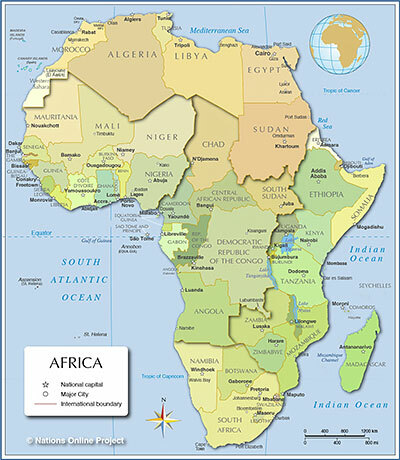 Africa is the second-largest continent in the world in both, area and population. It is an almost entirely isolated landmass, there is only a small land bridge in north east connecting Africa with Western Asia. Area: about 30,244,000 km² (11,700,000 mi²) including its adjacent islands it covers about 20 percent of Earth's total land area. The area of Mainland Africa is shared by 48 countries, plus six island nations (see list below). Population: 1.1 billion human inhabitants, about 14 percent of the world's population (in 2016). By far the most populated country is Nigeria with 185 million people. Highest Point: Mount Kilimanjaro, Uhuru Peak on the volcano Kibo, 5 895 m (19 340 ft) in Tanzania. Largest Lake: Lake Victoria or Victoria Nyanza; 68,870 km², shared by Uganda, Kenya, and Tanzania. Longest River: Nile; 6 695 km, the river flows through eleven countries. Afro-Asiatic (e.g. Berber language), Nilo-Saharan, Niger-Congo (Bantu), and Khoi-San. 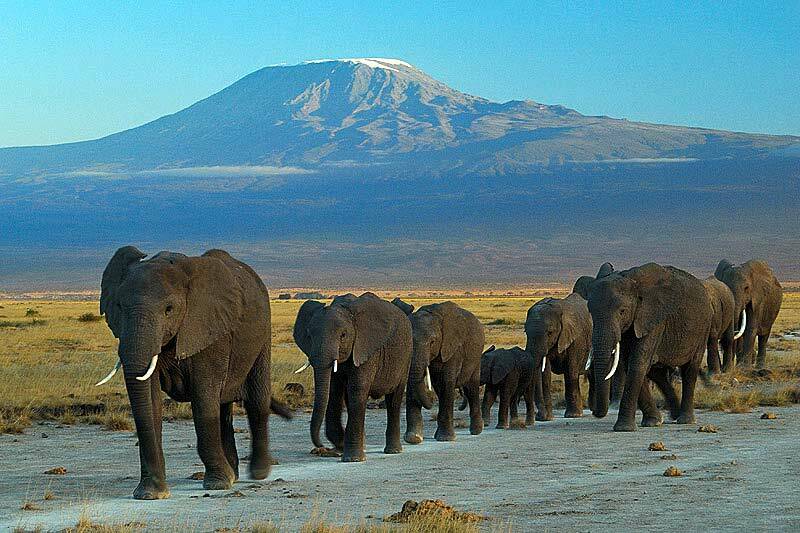 Elephant herd at Amboseli National Park with Mount Kilimanjaro in background, Tanzania.